If you take slabs and tile them as a ceiling, the shadows are incorrect. If you tile the whole ceiling it becomes almost black, regardless of any room lighting. 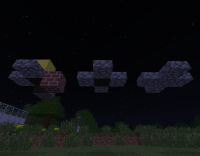 Create a 3x3 (or 4x4 is better) tile of slabs on a ceiling. MC-6215 Lighting bug on the side of Stone stairs. 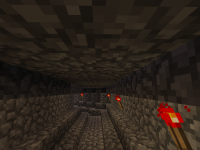 MC-8768 When a slab is above a chest and a solid block/slab is infront it creates a lighting bug. MC-16845 Tryed to make safe place for the crops but two slabs that had 1 block hight from another blocked light. MC-53085 Whenever there is an upside down staircase that is inverted (That is, 7/8 of the full block is there except for one of the bottom corners), the area that is not filled in (the other 1/8) is always darkened. MC-107362 Light showing through half slabs. 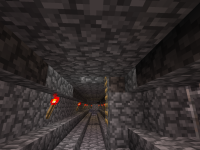 MC-109401 Lighting bug involving slabs, sides appear darker. MC-304 Slabs not lighting properly when placed in upward position. MC-758 Stairs have lighting glitches.